Who doesn't love brownies? Who doesn't love cream cheese? Who doesn't love both in one? I made these a few weeks ago for a dear friend who I hadn't seen in months. I was moving into my apartment at the time and she happened to be in town so she [and another good friend] came up to visit. Now, I love brownies. I use one standard brownie recipe and then make alterations to the original recipe to come up with variations. This was no different. I'll give you the standard recipe first, then the cream cheese part. Preheat the oven to 350 degrees Fahrenheit and grease a 9x12-inch pan. To make brownie batter, break the chocolate into bits and place in a microwave-safe bowl along with the butter and melt. If you’re using a microwave, start off with 1 minute, stir, and heat in increments of 15 seconds so you don’t overcook the chocolate. If you’re using the stove, set the bowl over a pan of simmering water and let it sit for 5-10 minutes, stirring occasionally until the chocolate is smooth. Allow the mixture to cool for 5 minutes. Beat the eggs, sugar, and coffee until smooth, then gradually beat in the cooled chocolate mixture. Sift the flour and salt into the mixture, and then fold it in along with the vanilla. Now, at this point the brownie batter is done. If you feel like making plain brownies, pour the batter in the pan and bake for 30-35 minutes. If you feel like adding a cup chocolate chips or some sort of nut to the batter [walnuts are typically the nut of choice for brownies], go for it. I've even dolloped raspberry preserves on top for raspberry-swirled brownies. But for this particular batch, I used some cream cheese. Pour the brownie batter into your greased pan and let sit while you prepare the topping. 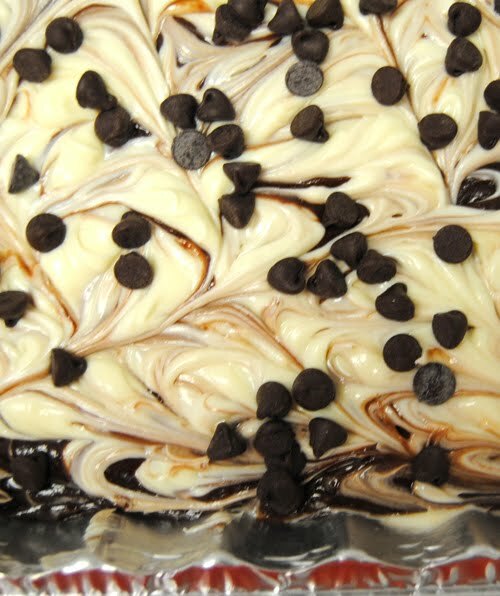 To make cream cheese topping, beat all ingredients aside from the chocolate chips in a bowl until smooth. 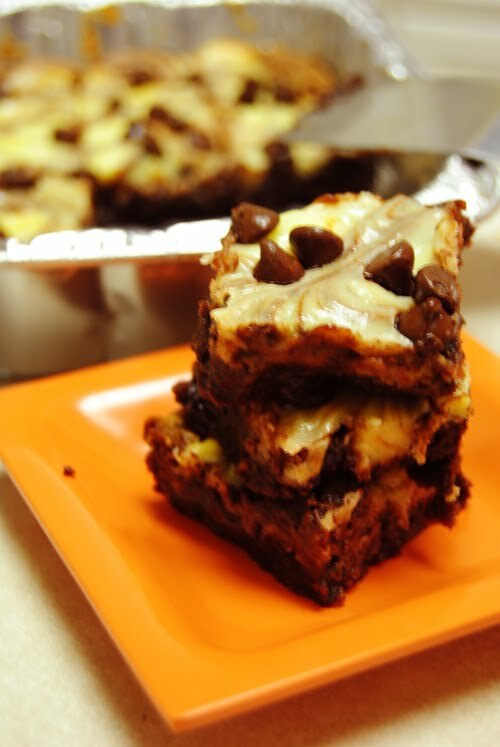 Drop dollops of the cream cheese over the top of the brownie batter. 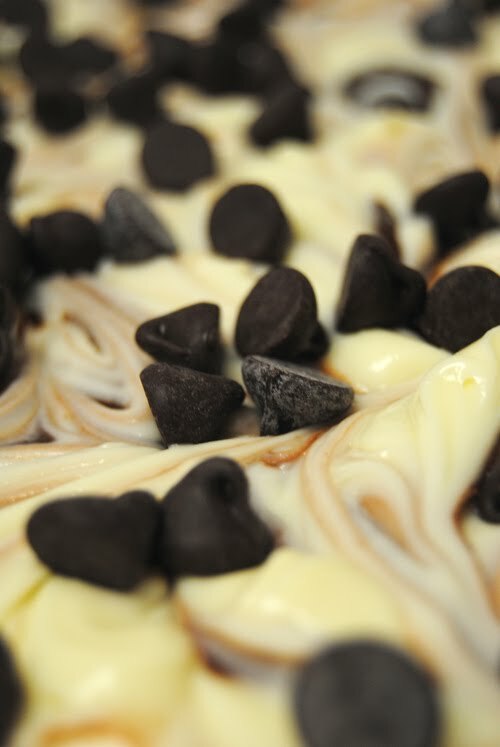 Swirl the cream cheese with a knife. Sprinkle chocolate chips over the swirled cream cheese. Bake for 35-40 minutes; 35 will make for slightly underbaked, extremely gooey brownies, but if you like yours 'well done', bake for a full 40 and check for doneness. Let cool completely before cutting. What I love about brownies is that they are so simple, and are guaranteed to be delicious every time. If they're made from scratch, of course. 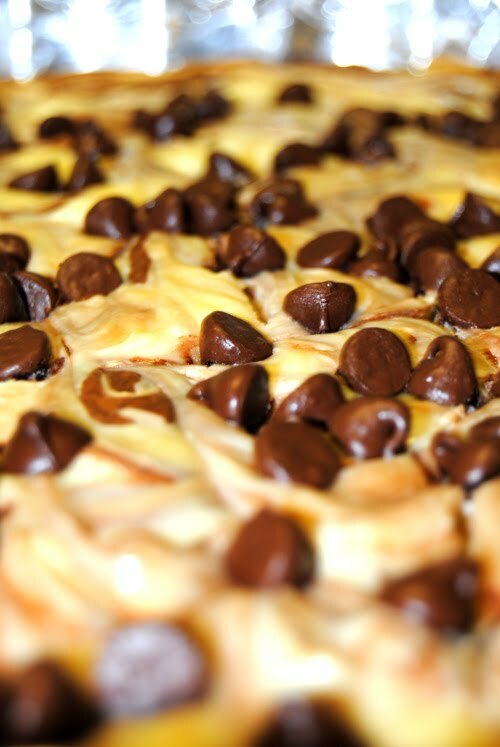 If you like chocolate at all, you have to try this recipe. Or hire a friend to bake it for you. Just eat. I've got a few more old recipes I'll try and post up soon. Until then, bon appetit! Salaam Sabeen! Mmmmm... Your browies look amazing! Would love to try your recipe - seeing it's xmas vacations I might just do it soon!